The post discusses a simple and effective industrial timer circuit which can be universally used for most industrial and home timer based applications. The idea was requested by Mr. Vasilis K.
I have a question regarding the 4060 ic wired as "one shot timer." If it can power on the two monostables from the pellet burner circuit, output will be taken from pin #3 which is the last to count to the C1 stage, will that work? 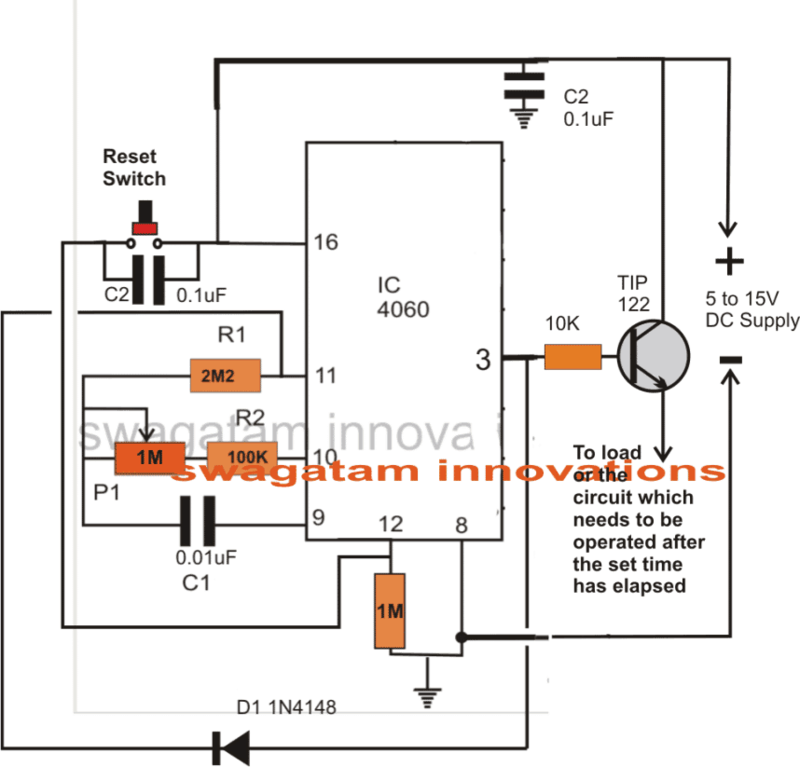 When power is applied to the circuit, the first 2 stages should stay low until the time has elapsed. Pin #3 should be set to activate the cycle, so when I leave home in the morning, I will be starting the timer via the thermostat. Then when I get home, the burner should be running. My request is when power is applied after the predetermined time of the 4060 has elapsed, is to activate the cycle (Stage 1&2), as there is no need for the burner to run when no one is around, plus this would be ideal as it takes about an hour for the water temperature to reach at 75 Celsius. The IC 4060 is an excellent option when it comes to any timer based industrial or home project. This chip being a CMOS device is highly accurate, and is able to generate time delay periods of as high as upto 10 hours with reasonably good accuracy, after this limit the accuracy tends to drift a bit. Although the IC 4060 generates a fixed 50% duty cycle astable type of oscillations at its various outputs, it can be configured as a one shot timer, as explained in the present article. Referring to the shown simple industrial adjustable timer circuit, we can see the IC being the central main component of the whole design. When power is applied or switched ON, C2 momentarily pulses pin#12 of the IC and resets the timing so that the internal oscillator begins counting from zero, moreover the IC can be reset at any moment during the counting period by pressing the given reset switch. Now as per the setting or selection of R2, P1 and C1, as soon as the set timing elapses, pin#3 goes high, switching ON the transistor and allowing the power to pass to the connected circuit, which now activates. The feedback diode from pin#3 to pin#11 instantly locks the internal oscillator and latches the circuit so that the circuit freezes in that position until the reset switch is pressed for initiating a new cycle. For heavier loads, the above circuit may be upgraded with a relay for identical results but with much higher load current handling capabilities. TESTED & WORKING, really happy with the outcome, i used the 2nd circuit with the relay as i didn't have that specific transistor, that would be my last request for you, i hope i wasn't that much of a pain, again really thankful for all the help and effort, god bless you!! I have simulated your design plan on proteus, but it does not run. Can you see if I have simulated properly? Thanks, i Will try again. I have connected the circuit as shown in the post with the indicator LED for testing but rather than staying off, the LED keeps blinking before staying on and then resumes blinking again, and then stay on. The process continues indefinitely. What could be the problem sir? Hello Godson, that shouldn’t happen, because initially the red LED must stay OFF, and as soon as pin#3 goes high after the elapsed period the positive from this pin should latch pin#11 stopping the counting and causing the LED to become solid (pin#3 latched at permanent high). you can try changing the pin#12 0.1uF cap with a higher value capacitor and see if it helps…also while testing power the circuit from a good 12V DC power supply. 1. In the comment, you said that in order to keep the relay activated during the timing period, the BC547 should be replaced with BC557 and that the emitter should be connected to the positive supply and relay-diode assembly should be connected between the collector of BC557 and GND. Please I need you to confirm that sir. 2. What value of P1 and C1 should I used in order to achieve 3hours of timing? If there is a formula for it, kindly help me with it. Thank you for all your efforts sir. Hi Godson, yes that’ correct, use PNP to initiate the relay with power switch ON, the push button is for resetting the timer to zero, it is not required to start the timing, the timer will automatically start as soon as power is switched ON. the reset button can be used to reset the timing to zero anytime. use any small arbitrary value for C1, note the timing delay for this C1 practically and then divide 3 hours with this delay value. make sure to convert 3 hours to seconds if the delay value was in seconds. Thank you very much for the response sir. I’ll do as you said. 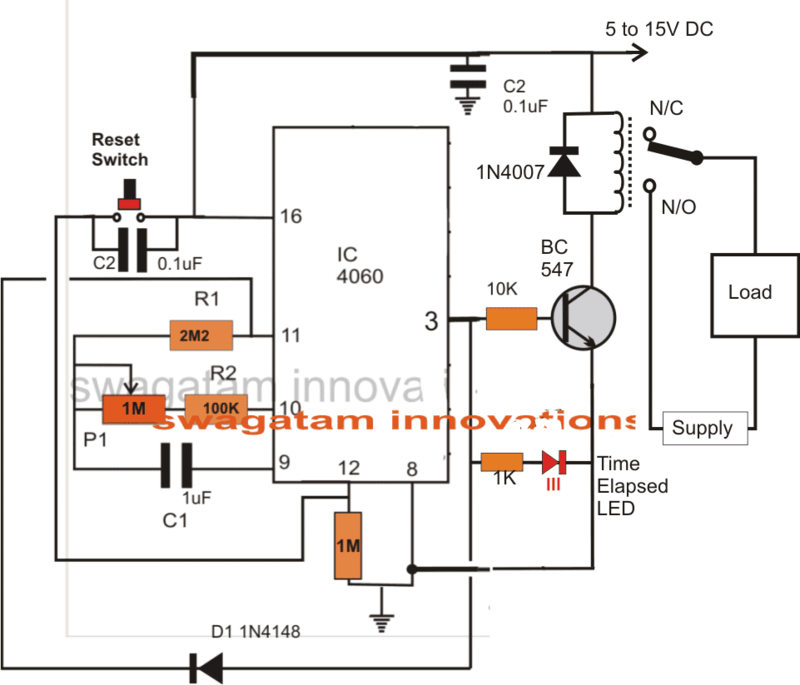 In the case of using a PNP transistor, how will the “time elapsed LED” be connected? is possible obtain a opposte one-shot timer, in other words, when i press the button the load is swicth on for a preset time, elapsed this time, the load switch off and the timer remain in wait for next push. You can use 2 NPN transistors instead of one PNP transistor. you can achieve up to more than 10 hours of delay with reasonable accuracy with this IC. gud day can you please post an effective PWM for my HHO. 12v, 60 A. Sir.. Can you please design for me a circuit that counts down from 30 seconds to 0,that has a reset button which brings back the timer to 30. And also a pause button,this circuit will serve as a 30 second shot clock for amateur basketball. This is what I need for my school project. Hi Jason, I'll try to do it soon. sir i already emailed you the diagram. You will have to show me the diagram that you have constructed only then i would be able to provide an appropriate suggestion.